Nearest weather station, with distance and direction from RNA: The nearest weather station is at Devil’s Knob, 11 miles southwest of the RNA. Annual precipitation (type, seasonal distribution): Annual precipitation averages 54.8 in (139.2 cm), including average annual snowfall of 11 in (27.9 cm). Maximum and minimum temperatures: The average annual temperature is 57.8° F (14.3° C. Temperature extremes have varied from a high of 104° F (40° C) to –13° F (–25° C). Average monthly temperatures range from 36° F (2° C) to 77° F (25° C). Elevation: 1400–2165 ft (427–660 m). 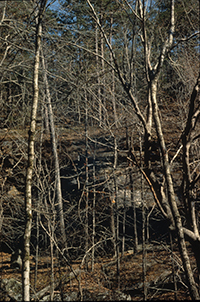 Geology and Soils: Dismal Hollow RNA is made up of two steep canyon-like ravines formed by long term stream erosion of the geologic surface by the Dismal and Gladon Creek Systems. The area is bounded by spectacular near vertical 60 to 80 foot high bluffs formed by erosion of the middle Bloyd sandstone. Erosion of geologic material at the base of the bluffs has formed the many shelter caves once inhabited by prehistoric Indians. Aquatic Features: Dismal and Gladon Creeks are included in the RNA. The area is partly bounded on the north and east by the East Fork of the Little Buffalo River. Plant Communities: Forest vegetation occupies all of the area below the bluffline and consists of an overstory of hardwoods principally American beech (Fagus grandfolia), northern red oak (Quercus rubra), cucumbertree (Magnolia acuminata), American basswood (Tilia americana), white ash (Fraxinus americana), green ash (Fraxinus pennsylvanica) and sweetgum (Liquidambar styracif1ua). At Risk Species: Rare species found in the RNA include: alternate leaved dogwood (Cornus alternifolia), yellow mandarin (Disporum lanuginosum), French’s shooting star (Dodecatheon frenchii), shining clubmoss (Lycopodium lucidulum), Ozark spiderwort (Trandescantia ozarkana) and bristlefern (Trichomanes boschianum). Common Shrub Species: The understory commonly includes dogwood (Cornus florida), umbrella magnolia (Magnolia tripetala), pawpaw (Asimina triloba), American hornbeam (Carpinus caroliniana), eastern hophornbeam (Ostrya virginiana), spicebush (Lindera benzoin) and Carolina buckthorn (Rhamnus caroliniana). Common Herbaceous Species: The understory includes numerous species in addition to the rare species. A list is included in the Establishment Record. Common Mammal Species: Common mammals in the RNA include the following and a variety of small mammals, such as rats, mice, voles and shrews. Common Bird Species: Common avifauna that may occur in the area include: the northern cardinal (Cardinalis cardinalis), blue jay (Cyanocitta cristata), tufted titmouse (Parus bicolor), dark eyed junco (Junco hyemalis), Carolina chickadee (Parus carolinensis), wild turkey (Meleagris gallopavo), bobwhite quail (Colinus virginianus), great horned owl (Bubo virginianus), barred owl (Strix varia), red shouldered hawk (Buteo lineatus), red tailed hawk (Buteo Jamaicensis), chuck wi ll’s widow (Caprimulgus carolinensis), whip poor will (Caprimulgus vociferus), various woodpeckers and numerous species of warblers, vireos, flycatchers and other passerine birds.